Situated on vibrant Bui Thi Xuan Street, Queen Ann Hotel is built in modern and luxurious architecture. With its prime location at the heart of Ho Chi Minh City - the economic and tourist center of South Vietnam, it is a convenient stay for both business and leisure travelers. Queen Ann Saigon Hotel invests in the design of rooms in European standards, equipped with full facilities. All rooms have fire protection, private telephone, central air conditioning, 40 inch TV, cable TV, mini bar, safety box, relaxing sofa, standing bath & shower. There is a foot massage, tour desk and business center. 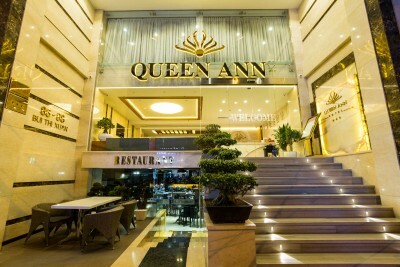 Queen Ann Hotel is a 10-minute walk from Ben Thanh Market. Tan Son Nhat International Airport is a 20-minute drive away. The 24-hour front desk has a safety deposit box. Currency exchange and airport shuttle services are available at the hotel for your convenience. With a team of professional service, clean space luxury, we will bring you a holiday or work is very comfortable.